Uspinjača is one of the symbols of the city as it’s the first & oldest public transport in Zagreb. Back in 1890 the funicular was powered by steam engine that broke down easily so the passengers had to go out and push it. Thankfully, in 1934, an electric motor was installed and it has been a smooth ride ever since. Uspinjača is in Tomićeva street, only a few steps from Square Trg bana Jelačića. It connects Lower town (Donji grad) with Upper town (Gornji grad). The Upper town is a place to be if you visit Zagreb. This area is ancient — from prehistoric times to Roman & Middle ages. Also, the Upper town is the starting point of slopes of mountain Medvednica, so it’s on a hill. You can walk uphill, climb the stairs or ride the funicular. I remember the first time when my parents took me on a ride on Uspinjača. I was so excited, but only for 64 seconds. That’s how long the ride takes because it’s the shortest funicular in the world. Only 66 meters. But I still like to ride it, no matter how old I get. It’s kind of fun, cheap, has a great view and gets you in front of Lotrščak Tower and a beautiful city viewpoint. It’s also kind of romantic. 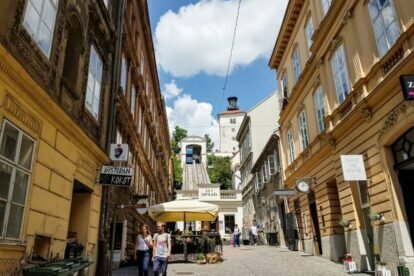 For all of you lovebirds, I suggest a funicular ride to Strossmayerovo šetalište where you can take a walk on the most dreamy promenade in Zagreb with tall oak trees, benches and a beautiful view of Downtown.